"Pavel Chekhov" redirects here. For the Russian tennis player, see Pavel Chekhov (tennis). This name uses Eastern Slavic naming customs; the patronymic is Andreievich and the family name is Chekov. Pavel Andreievich Chekov (Russian: Павел Андреевич Чеков) is a fictional character in the Star Trek universe. Walter Koenig portrayed Chekov in the second and third seasons of the original Star Trek series and the first seven Star Trek films. 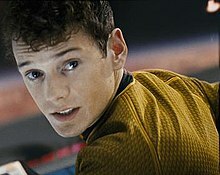 Anton Yelchin portrayed the character in the 2009 Star Trek reboot film and two sequels, Star Trek Into Darkness and Star Trek Beyond. Koenig's modest height, eyes, thick eyebrows, boyish face, and smile were all strikingly evocative of the lone British "Monkee" who captivated millions of pre-teen girls. Early attempts were made to style Koenig's brown hair similar to that of Jones too. Wigs were used in a couple of early episodes but not in others, which reveals a stage of experimentation to attentive viewers. Eventually, a final and consistent look for Koenig's hair length and fullness was reached and used consistently thereafter. After Paramount Television signed Koenig to a contract because of the number of fan letters he received as Chekov, Roddenberry wrote in another memo "Kirk and Spock and the others actually seem rather 'middle aged' to the large youthful segment of our audience. We badly need a young man aboard the Enterprise—we need youthful attitudes and perspectives. Chekov can be used potently here". In actuality, Koenig is only five years younger than co-stars Leonard Nimoy and William Shatner. Pavel Andreievich Chekov was born in 2241 in Russia and is a young and naïve ensign who first appears on-screen in The Original Series’ second season as the Enterprise's navigator. According to Roddenberry, he is "an extraordinarily capable young man—almost Spock's equal in some areas. An honor graduate of the Space Academy." Chekov also substitutes for Mr. Spock at the science officer station when necessary. His promotion to lieutenant for Star Trek: The Motion Picture brings with it his transfer as the ship's tactical officer and chief of security. By the events of Star Trek II: The Wrath of Khan, Chekov is executive officer aboard the USS Reliant. In that film, Khan Noonien Singh uses a creature that wraps itself around Chekov's cerebral cortex to control him and his captain. Chekov overcomes the creature's mind control and serves as Enterprise tactical officer in the film's climactic battle. Although Khan recognizes Chekov in the film, the Chekov character is not a visible part of the crew during "Space Seed", the first-season episode that introduces Khan. Adaptations: From Text to Screen, Screen to Text calls this "the apparent gaffe notorious throughout Star Trek fandom". Koenig joked that Khan remembers Chekov from the episode after he takes too long in a restroom Khan wants to use. Chekov is an accomplice in Kirk's theft of the Enterprise to rescue Spock in Star Trek III: The Search for Spock, but is exonerated in Star Trek IV: The Voyage Home. He serves as navigator aboard the Enterprise-A during the events of Star Trek V: The Final Frontier and Star Trek VI: The Undiscovered Country. The character's final film appearance is as a guest aboard the Enterprise-B on its maiden voyage in Star Trek Generations. Spinoff novels show a continued career path, but these are not considered canon in the Star Trek universe. Novels written by William Shatner detail that Chekov reaches the rank of admiral, and even serves as Commander in Chief of Starfleet. The 2009 Star Trek film creates an alternate timeline in the franchise. In this timeline, Anton Yelchin's portrayal presents Chekov as a 17-year-old prodigy whose mathematical ability proves instrumental in a few events within the film, and whose accent provides some of the film's comic relief. In the sequel, Star Trek Into Darkness, Chekov finds himself promoted to chief engineer after Scotty resigns. When Kirk orders him to put on a red shirt, a brief sting is heard as a closeup shows Chekov's nervous face, playing on the reputation of redshirts in the franchise as much as the character's shock regarding his sudden promotion. The third film, Star Trek Beyond, was Yelchin's final appearance as Chekov, the film seeing Chekov accompanying Kirk after the entire crew are marooned on an uncharted planet following the destruction of the Enterprise, forcing them to destroy the last of the Enterprise to escape a trap and later work with the rest of the senior staff to restart a long-lost Starfleet ship to escape the planet and defeat a plan to attack the Federation. Yelchin was crushed to death by his 2016 Jeep Grand Cherokee on June 19, 2016, little more than a month before its scheduled release on July 22, 2016. All of the filming had already taken place, and the film was in its post production phase, with the credits including dedication to his memory. J. J. Abrams, producer of the reboot trilogy and director of its first two films, has stated that the role will not be recast for future sequels, implying the character of Chekov will be written out in future films. Walter Koenig reprised his role as Chekov 12 years after Star Trek Generations in the fan-created series New Voyages episode "To Serve All My Days". Andy Bray portrayed a younger Chekov in that episode. Koenig reprised the character again in Star Trek: Renegades as 143-year-old Admiral Chekov, the newly appointed head of Section 31. He has stated that should there be a sequel, he would reprise Chekov and then retire from the role. He also returned as Chekov in the online miniseries Star Trek: Of Gods and Men. In scientific illustrator Jenny Parks' 2017 book Star Trek Cats, Chekov is depicted as a Russian Blue. ^ a b c d Solow, Herbert; Justman, Robert (1997). Inside Star Trek: The Real Story. Simon & Schuster. ISBN 0-671-00974-5. ^ Barbara and David P. Mikkelson (April 11, 2005). "Russian Crewlette". Urban Legends Reference Pages. ^ Paul A. Cantor (2001). Gilligan Unbound: Popular Culture in the Age of Globalization. Rowman & Littlefield. p. 222. ISBN 0-7425-0779-3. ^ Mandel, Geoffrey (1980). USS Enterprise Officer's Manual. 201W 18th St. Apt 20A, New York, NY. 10011: Inplmmml [terstellar Associates. p. 17. ^ "Las Vegas 2004: Thursday's Highlights". www.startrek.com. July 30, 2009. Retrieved November 21, 2009. ^ Burr, Ty (May 5, 2009). "Star Trek". The Boston Globe. p. 1. Retrieved May 6, 2009. ^ Sue (April 27, 2017). "Interview: Star Trek Cats' Jenny Parks". Women at Warp. womenatwarp.com. Retrieved February 25, 2018. ^ Olson, Laurie Kay (December 16, 2017). "Jenny Parks Cat Art Is Feline Nerdvana!". Petslady.com. Halcyon Solutions Inc. Retrieved February 26, 2018.